Computational intelligence (CI) encompasses approaches primarily based on artificial neural networks, fuzzy logic rules, evolutionary algorithms, support vector machines and also approaches that combine two or more techniques (hybrid). These methods have been applied to solve many complex and diverse problems. Recent years have seen many new developments in CI techniques and, consequently, this has led to many applications in a variety of areas including engineering, finance, social and biomedical. In particular, CI techniques are increasingly being used in biomedical and human movement areas because of the complexity of the biological systems. 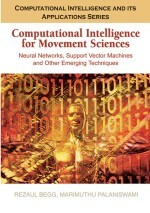 The main objective of this chapter is to provide a brief description of the major computational intelligence techniques for pattern recognition and modelling tasks that often appear in biomedical, health and human movement research.